Blue Lagoon Island has two excursion types. The first is a beach day on their secluded beach which is literally like swimming in paradise. This excursion offers full day or half day options. NOTES: If you are sailing on Disney Cruise Line (or any other cruise line with their own private island) in all likelihood your itinerary will include a day at Disney’s private island, Castaway Cay, so a half day at Blue Lagoon is really all you will need. This will give you a chance to get off the ship for a little bit yet by coming back early you will have the ship almost to yourself. The second excursion Blue Lagoon Island offers is an animal encounter. Again, you have some choices to make. The first choice is what kind of animal you would like to meet. 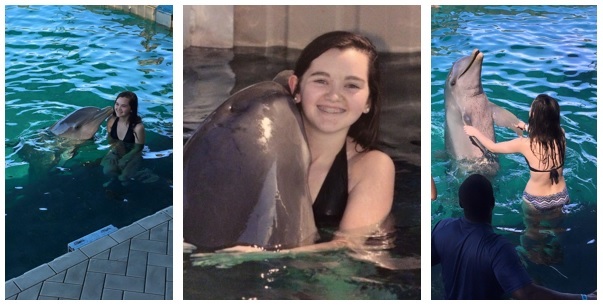 They have both dolphins and sea lions. The second choice to make is whether you want to swim with the animal or just wade in the water with them. There is an advantage to just wading as opposed to swimming: the cost is about $90 cheaper to wade and you still get an amazing experience. NOTE: If not everyone in your traveling party wants to do an animal encounter, you can also book an observer ticket where you get access to the island to watch someone do their encounter. This is a great option for parents who just want to have their kids do one of the encounters like we did. Just know though, someone in your party must have booked an animal encounter to buy an observer ticket. You will receive tickets before your excursion day which will tell you where to meet to begin your adventure. For us, we began in the Buena Vista Theatre where they gave us our instructions. NOTE: Make sure to bring your identification (ie. passport, driver license, birth certificate, etc.) as you will have to pass back through immigration to return to the ship. As a group we were then ushered out of the ship to a waiting boat which took approximately 25-minute to reach the secluded island. Keep an eye out during your voyage to the island. Rumor has it there are several celebrity homes on Paradise Island which you will pass by. We were told some of the houses currently, or previously, belonged to Nicolas Cage, Tiger Wood, Michael Jordan and Oprah Winfrey. When we arrived at the island we were separated into two group. The first was the guests who booked a beach day. The second group were those who will booked an animal encounter. From there those of us with animal encounter and observer tickets we were sent to a seating area where we learned about the animal we would be encountering. This educational piece is a great introduction. After the video and a question and answer session we were separated again to those who will be doing to the swim and those doing the encounter. For our excursion we paid for my daughter to do the encounter while my husband and I paid to be observers. To begin, the participants (about 10 ppl) stepped down to a submerged platform which put them in about waist deep water. (Even non-swimmers will felt comfortable with this depth.) Throughout the approximately 45-minute encounter the leader put the dolphin through a series of commands such as hugging, kissing and dancing with the participants all while continuing to educate all participants and observers about the dolphins and what amazing creatures they are. One of the best parts of the adventure was our tour guide. 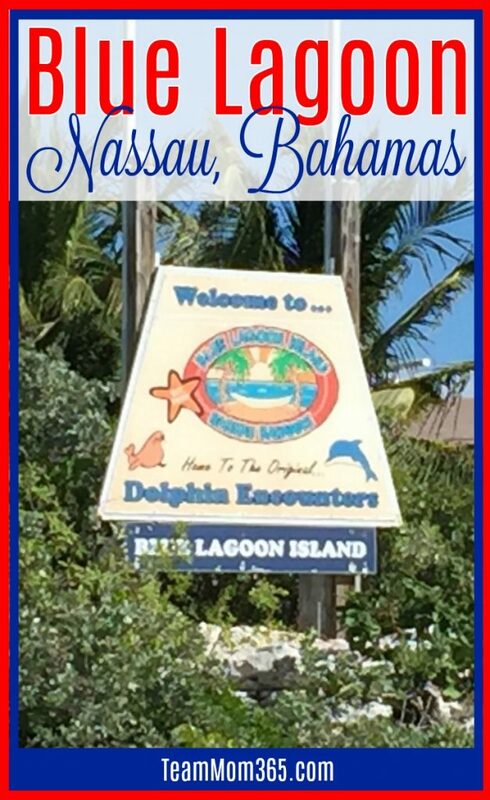 He gave us gobs of interesting information about the dolphins as well as the Bahamas and the wildlife in the area. He also kept us quite entertained with his singing and jokes. The total encounter took approximately two hours after which we had the run of the island. We decided to walk around the animal encounter area and even went over to the sea lion area. While we could have stuck around even longer, as those with animal encounter tickets can also enjoy the beach, we decided to head back to the ship for some quality time with the AquaDuck where the lines were virtually non-existent. If you ask my daughter about the experience she will immediately tell you this was one the best days in her young 17-year-old life. Yes, she has plenty of moments yet to come, but for now that is high praise. As a parent/observer, it was an amazing experience watching her have the time of her life. To book a Blue Lagoon Island excursion yourself you should contact your cruise line. By booking through your them you are given some assurances such as the ship won’t leave if your group doesn’t get back on time. 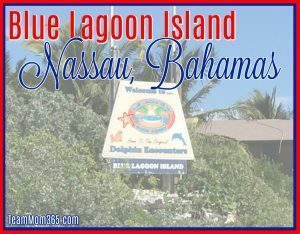 If you will be in Nassau, not on a cruise, you can book directly via the Blue Lagoon Island website. You can follow our journey here: Facebook, Twitter and Pinterest for more great Team Mom, parenting, travel and Lifestyle content.